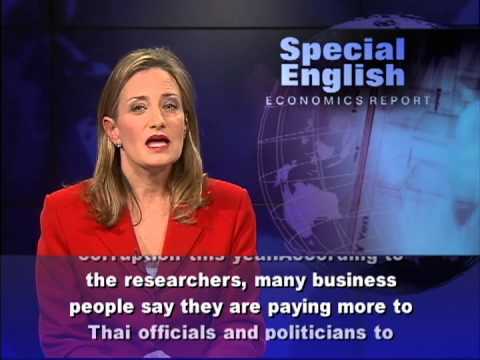 From VOA Learning English, this is the Economics Report. Many Thais joined protests in Bangkok last year. They urged Prime Minister Yingluck Shinawatra to deal with the growing problem of corruption in their country. How much economic activity is lost to corruption is difficult to estimate. The University of the Thai Chamber of Commerce studied the issue not too long ago. The university found that more than two percent of all of the goods and services produced in Thailand, or worth about $11 billion, will likely be lost to corruption this year. According to the researchers, many business people say they are paying more to Thai officials and politicians to win government contracts. Political economist Pasuk Pongpaichit says there is evidence that officials are making progress in controlling low level corruption. But, she says, the slowing world economy means growing competition for profitable deals with the government. Bandid Nijathaworn is a former central bank official and President of the Thai Institute of Directors. He says corruption in Thailand appears to be more of a problem now than it was 10 years ago. And the problem affects more than Thailand.